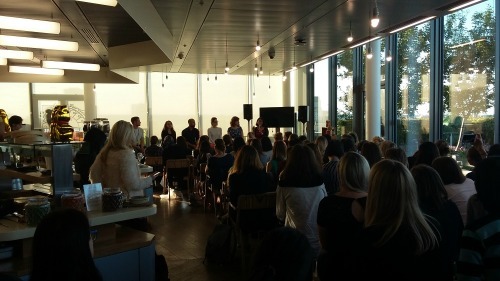 Last October Ladies that UX went to the Google offices to hear about how their researchers conduct international research. It was a fascinating event and we all agreed we wanted to know more! So this week we went back for part two. This time we had a panel made up of researchers from various teams across Google. Melissa Klayman moderated while Craig Spencer, Maha Salem, Alessandra Millar, Saswati Saha Mitra and Raj Arjan answered Melissas and our questions. They started by discussing how research can have impact and how taking stakeholders with them when doing research can have the biggest impact and help to make sure the project gets backing. They also spoke about how language can be an issue but you can still learn a lot if you try, for instance they have used body language, Google translate and drawing to find out what issues people have with their products. Their biggest challenges include the unknown (pre-work helps with this), relying on unknown research agencies, making sure they take enough time without it seeming too slow and deciding which insights to share on their return. "Always take a scarf with you. You do not know when you might need to cover up due to culture or air conditioning"
They also spoke about other methods of research and how to decide when to visit (when you need to meet the people or observe behaviour) and when to do remote research (when language is going to be a big barrier or when working to a tight schedule). I personally found the discussion around distilling results very interesting, with each team doing it differently. From the classic war room where you surround yourself with all your research, to storyboarding what the report or slides should include and using spreadsheets to collate everything. As this was Ladies that UX they also gave some advice about visiting other cultures. Firstly do your homework to be aware of any customs or likely behaviours so you are ready. You need to be able to leave your personal views at home and respect their culture, even if you do not agree with their ideas. You also need to be aware if it could affect your research, for instance some cultures would not expect women to conduct research, so you might need to take a male colleague with you. And lastly always take a scarf with you. You do not know when you might need to cover up due to culture or air conditioning. The last thing I really took on board was 'do not judge'. It was once again a really interesting event which gave me some great insight which I hope to take back to my current role. Ladies that UX is now done for the summer. We are back at the end of September with an event on designing for kids.